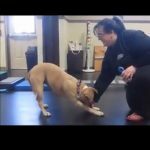 Rehabilitation for dogs and why it is important! Rehabilitation for companion animals is the new standard of care for treatment of many conditions that limit an animal’s mobility. Rehabilitation accelerates healing and helps maximize return to normal muscular or motor function. Injury, surgery or immobilization can lead to rapid muscle loss and joint stiffening. Our overall goal is always to decrease pain and increase mobility. When a senior pet seems reluctant to go on walks, climb stairs or jump into the car, many owners feel the dog is simply “getting old.” While older dogs often suffer from arthritis, rear leg weakness and neurological dysfunction that can lead to reduced exercise ability; decreased function is not inevitable. Geriatric pets can be supported in the normal aging process through rehabilitation techniques that reduce pain, restore mobility, and greatly enhance quality of life. Following an evaluation, your dog’s individualized protocol is developed. Protocols typically incorporate a multi-modality approach with an emphasis of home regimens and in house therapies, depending on your pet’s condition and needs. After your evaluation the Animal Therapy Center sends your pet's report to your primary care physician and/or surgeon to ensure a cohesive healthcare experience. Below are some of the most common conditions we treat.